'The Lost Plays of Tennessee Williams' moves to a new home along with the author's devoted adherent. When Jack Heller was a student living in New Jersey, he happened to be walking through Manhattan one day in 1959 when he chanced upon a theater presenting a new play by Tennessee Williams: "Sweet Bird of Youth." And the playwright himself was standing outside. "I said, 'Mr. Williams, I'm a student, I don't have much money and would love to see this play,' " Heller recalls. Williams let Heller in to the play. Heller had been a fan of Williams ever since he saw the movie version of "A Streetcar Named Desire" when he was 13. "It just blew me away," he says. "It was amazing." More than half a century later, the playwright still has that effect on Heller -- who acts in one and directs another of three recently discovered plays by Williams. Called "The Lost Plays of Tennessee Williams," the trio opens on Thursday at the Coast Playhouse, after having had its West Coast premiere at the L.A. Gay & Lesbian Center's Tomlin/Wagner Cultural Arts Center. "These are little lost jewels, gems, as timely as ever," says producer Jon Imparato. "We haven't updated them. It's like finding lost treasure in your attic. The actors are giving tour de force performances." Williams, who died in 1983, was best known for such works as "The Glass Menagerie," "A Streetcar Named Desire," "The Rose Tattoo" and "Cat on a Hot Tin Roof," but he left behind more than 70 unpublished plays, many of them one-act studies. "The little glass slippers lost in my midnight scramble down the stairs," Williams called these works. As an actor and director, Heller never lost his fascination with Williams. 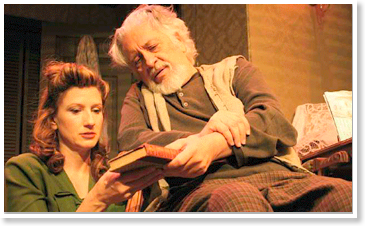 He even portrayed the playwright in "Tennessee in the Summer" in 2000 at the Egyptian Arena in Hollywood. Five years later, Heller picked up a copy of "Mister Paradise and Other One-act Plays," a newly published collection of 13 works never produced during Williams' life. "I've always admired Williams," says Heller, who is working on a project to create a Williams festival in L.A. "Why not do an evening of these plays?" "Lost Plays" lasts just about 90 minutes -- yet it manages to run a gamut of themes and moods, from bitter disappointment to unrequited longing, from a writer's study to a boxing locker room and the gay demimonde of New Orleans. The first play, "Mister Paradise," which was written around 1942, stars Heller as a drunken, has-been writer, reveling in his own failure and fending off the proffered help of a young acolyte. The second, "The Palooka," written in the late 1930s, deals with an up-and-coming boxer and a washed-up one meeting in a locker room between bouts. It clocks in at under 10 minutes. The last, longest work is "And Tell Sad Stories of the Death of Queens," which was written in 1959. Set in New Orleans, the play opens with a campy gay man bringing home a coarse sailor and introducing him to his alter ego: a drag queen named Candy. Candy is in his mid-30s, desperate for love after his longtime "husband" has left him for a younger man. The play opens with a sense of latent violence, veers into rollicking humor, then lurches back toward a dark and brutal conclusion. Williams was one of America's most celebrated playwrights, yet this was a work he knew would never be seen on the stage -- at least during his lifetime. "He didn't want the play produced because he would be put in jail," Heller says. "It would have destroyed him on Broadway. Today it seems mild compared to what is seen on stage." Heller says he directed the play as sort of a gay version of "A Streetcar Named Desire." Besides sharing a New Orleans locale, both works pivot around the mutually destructive relationship of two mismatched characters. "A lot of the people he writes about you'd probably cross the street to avoid," Heller says of the playwright. "But he writes about them with such compassion. He treats the transvestite in this play with such compassion. He's not just a campy queen. It's both funny and sad." Imparato says he thinks the three plays are as good as anything Williams ever wrote. "He gave himself artistic freedom to write these characters as they lived and breathed," says Imparato. "There are no limitations as there are in 'Cat on a Hot Tin Roof' or 'A Streetcar Named Desire.' In those plays you feel that his real voice wants to scream out. Did Brick have an affair with Skipper? Here Williams sat down and wrote the play he wanted to write, no restrictions. There's an enormous freedom there." "He knew it would never be produced," adds Imparato. "It's way too overtly gay. It's a wonderful thing; he probably wrote it for himself. I wish Tennessee could see where this is being produced. My God, look how far we've come." Long Stay Cut Short: Two One Act Plays by Tennessee Williams runs August 27 - September 21 at Actors Art Theatre.